The only thing more anticipated than the opening of American burger bars Shake Shack and Five Guys in London’s Covent Garden this year must be the arrival of the Royal Baby from Kate and Wills. With queues snaking down the street for both restaurants, you can’t help but wonder during the wait if the food will be worth your patience. Sadly, in the case of Shake Shack, it’s disappointingly not. Situated in Covent Garden under the glass atrium of the market, the first thing I noticed was the absence of a mouthwatering aroma. For a burger joint, this was highly surprising. 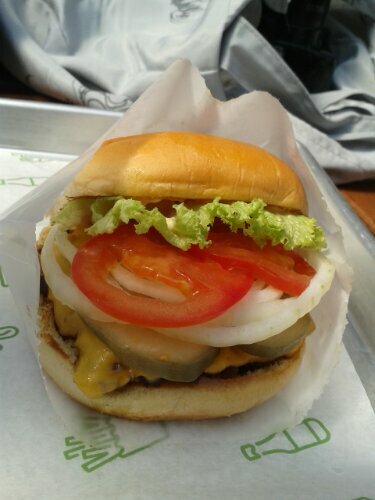 Upon reaching the counter, I ordered a ‘Shackburger’ – a cheeseburger with lettuce, tomato and Shacksauce – to which I requested my favoutite added toppings of onion and pickles. The finished product looked inviting: a shiny, brioche bun with fillings spilling out to create a rainbow of appetising colours. Biting into it, there was a big sensation of mush, even with the bite of the pickles and all I could taste was the raw onion; the plastic cheese was tasteless and the thin burger meat itself was equally bland – although it was nicely crispy on the outside which finally came through after a few bites. If the Shacksauce was in the burger, it was impossible to tell as there was no identifiable flavour. If ever there was a case of something being all frill and no knickers, Shake Shack is definitely it. I may give it another go in a few weeks to try a different burger but I’m not holding out much hope. Five Guys on the other hand, served me a tasty cheeseburger with sweet, cooked onions. The meat was tasty and had that typical American diner flavour – hints of a slight smokey char. Lovely. I know most people prefer Shake Shack but food can’t lie… the flavour test scored higher at Five Guys and I’d happily go back for another burger any day of the week.